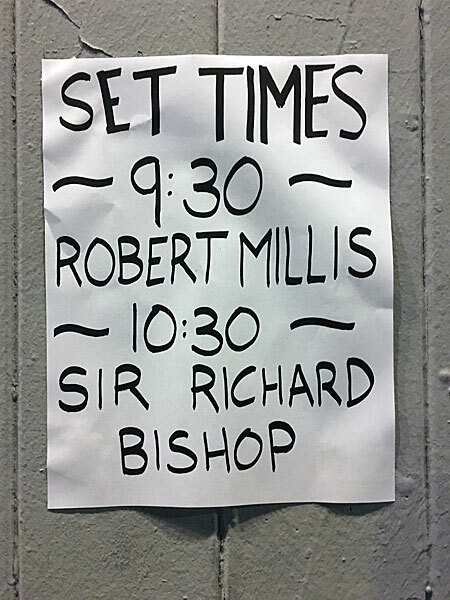 Sir Richard Bishop performs at the Bootleg Theater in Los Angeles, California on May 4, 2017. 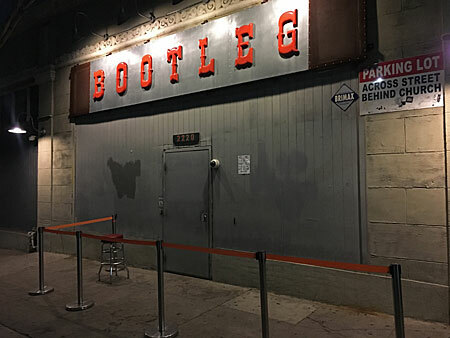 Upon arriving at the venue, the first thing I noticed was that it’s called the Bootleg Theater. I’m pretty sure that means if you fellas go to a show there, you’re automatically officially authorized to make bootleg recordings, GUYS. First up was Sir Robert Millis, a six-string slinger from Seattle who won’t hesitate to vigorously apply patches of modeling clay to every area of your face if you so much as glance in his direction. 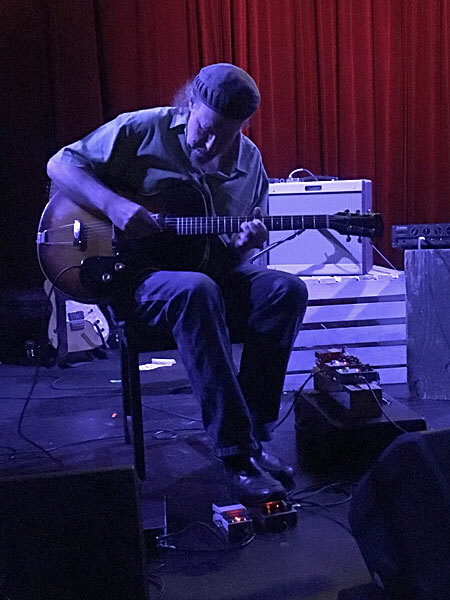 Mr. Millis completely dominated the stage, stomping around like King Kong (as you can see in the photo below) on a rampage through the pre-Keiji Haino city of Tokyo. He played several songs off of, I assume, his numerous albums. I’m not sure exactly which ones, so feel free to hire an attorney and take me to court. What the hell do I look like, the Discogs database? A long line of imaginary Sir Richard Bishop fans waits for the doors to open at the Bootleg Theater in Los Angeles, California. 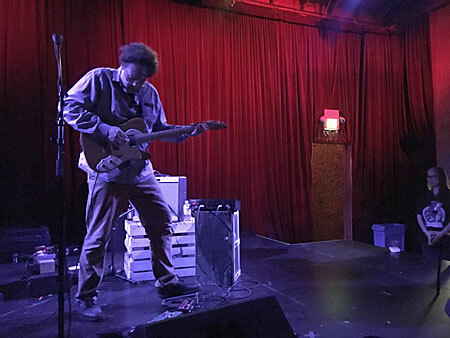 Next up, Portland’s Sir Richard Bishop took to the stage and completely killed it. I mean, he didn’t kill the mood. He created the mood–the best kind of mood. The sort of mood that will make you emit dragon vapors out of your mouth, nose and ears while twin decorative pillows hover in place in mid air, slowly rotating in circles on each side of your face. After the show, I cautiously approached Sir Robert Millis as he was exiting the stage. “Um, uh, muh muh muh Mr. Millis…” I stuttered. “Wuh wuh wuh would you mind signing my face?” Before I had even finished the request, Mr. Millis suddenly grabbed the front of my shirt with both hands and violently pulled me toward him–my head snapping back in the process–until my face was two inches away from his. “Listen here, punk,” he snarled, his face quaking with anger, “This place ain’t big enough for the both of us. I reckon it’s about time for you to mosey on out of town,” he drawled before shoving me away. Sir Robert Millis performs at the Bootleg Theater in Los Angeles, California on May 4, 2017. After slamming into the wall, I slowly got up and brushed myself off. It was then that I noticed that Mr. Millis was flanked by three beautiful giant squids on each side who put their tentacles around him and smiled and giggled while gazing up at him in utter admiration. Then the whole posse made their way over to a barnacle-covered stretch limo that was waiting out front. Actually, everything I just said was a complete fabrication. Set list at the Bootleg Theater in Los Angeles, California on May 4, 2017. The night ended over at the merch table, where I noticed close to a couple of dozen releases on offer from SRB, SRM and maybe even a few Sublime Frequencies albums. “I’d like to buy something, but I already have ALL of these records,” I admitted to Sir Robert. “That’s because you’re a total freak, but in the best possible way,” he replied, which was the perfect ending to an awesome night. Oh, I did manage to find one “record” I didn’t already have–a rare CD-R called Sound Tracks by SRM. It’s not even on Discogs…yet! Words and photos ©2018 by Arcane Candy. This entry was posted on Wednesday, July 4th, 2018 at 7:31 pm	and is filed under Robert Millis, Sir Richard Bishop. You can follow any responses to this entry through the RSS 2.0 feed. You can skip to the end and leave a response. Pinging is currently not allowed.